We know the Holy Spirit is here now and He will also remain on Earth during the tribulation. The Holy Spirit will be here during the tribulation, (Acts. 2:16-21; John 14:16; Zech. 12:10). The Bible also teaches a first and second coming of God the Father to the Earth? In Dan. 7:18-22 we have the fact that the Ancient of Days was coming to destroy the Antichrist. The Ancient of Days and the Son of man are two different persons, as proven in Dan. 7:9-14. If the Ancient of Days is not the Son of man, then He must be the Father. If He is the Father, then the Father is coming to the Earth when Christ comes. This is also proven in Zech. 14:5; Titus 2:11-13. We call this the first coming of the Father to the Earth to fulfil a mission. The Second Coming of the Father is at the end of the Millennium when the New Jerusalem, the capital city of God, comes from Heaven to the Earth to be among men forever, as stated in Rev. 21:1-21. This is the second time the Father is pictured in Scripture as coming to the Earth to fulfil a mission. This time He will be forever among men; and this planet, Earth, will be the site of His capital forever. The Holy Spirit here now, the Father and Son return to destroy the Antichrist, that's three separate and distinct beings Hill top. As you have chosen to ignore the scriptures I post, I see no reason to involve myself with your use of scripture to prove your religion. You baptize without baptism and serve more than one God. You said once that you don't commit sin. If your way actually does allow you to not commit sin, I can't argue against it. But I seriously doubt it does. I have not chosen to ignore any scriptures, so that is an incorrect assessment on your part. I study all scriptures and have for many years now and I am extremely familiar with all the verses you have posted concerning the various subjects. Pertaining to this subject of the Godhead, consider what the word "God" means in context every where it is used while you are studying. Also, look at all the verses relating to where two or more of the Godhead are together and how they are addressed and how they address each other. Some think you reject the truth, are prideful, and rebellious. I don't hold that view about you and hope that is not the case, but what I do hold is that you have not gone deep enough into God's word to understand some things. To some degree we all fit in that same boat and we grow as we learn. Understanding for most of us is not an overnight thing and some things come faster than others. You can know the deep things of God as they have been freely given to you as one of His. You wrote: "A spirit has no body". It wouldn't be a spirit if it had a body. ...and, "The Father and the Son will eventually be made one again." Just paraphrasing the God inspired scripture I posted. If the Father, a Spirit being, has no body, then explain to us how He sits on His throne. Rev. 3: 21, To him that overcometh will I grant to sit with me in my throne, even as I also overcame, and am set down with my Father in His throne. Without a directly pertinent scripture to answer your good question, I can only surmise that the throne is FOR Jesus. 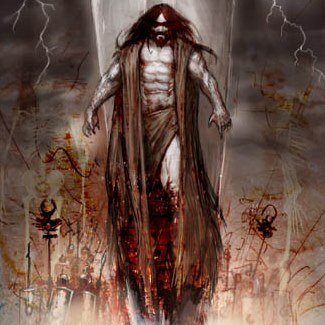 If all of heaven "is God's throne", why would He need a "chair", unless it was for a "bodied" Jesus? A spirit has no body. I'm guessing that you don't believe that the Holy Ghost has a body, either? "Ghost", "body": if it had a body it wouldn't be a ghost. Have you any scriptures where the Holy Ghost is manifested "with a body"? Was that baptism "in water"? If you say "yes", aren't you "adding to scripture"? You used this argument to delete water from the baptism spoken of in Romans 6 ...much to your loss. Last edited by branham1965 on Thu Jan 24, 2019 3:10 pm, edited 1 time in total. "It wouldn't be a spirit if it had a body." Angles are spirit beings also. Explain this Scripture please. Last edited by Ironman on Thu Jan 24, 2019 3:25 pm, edited 1 time in total.